Alja-Safe™ Breeze Product Information | Smooth-On, Inc.
No powder - no dust! 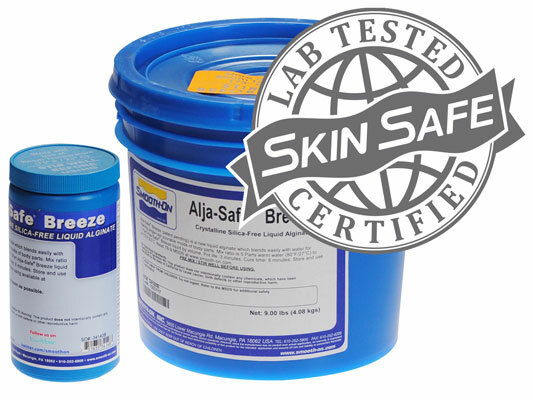 Alja-Safe™ Breeze (Patent Pending) is a new liquid alginate which blends easily with water, creating a unique, skin safe moldmaking material. 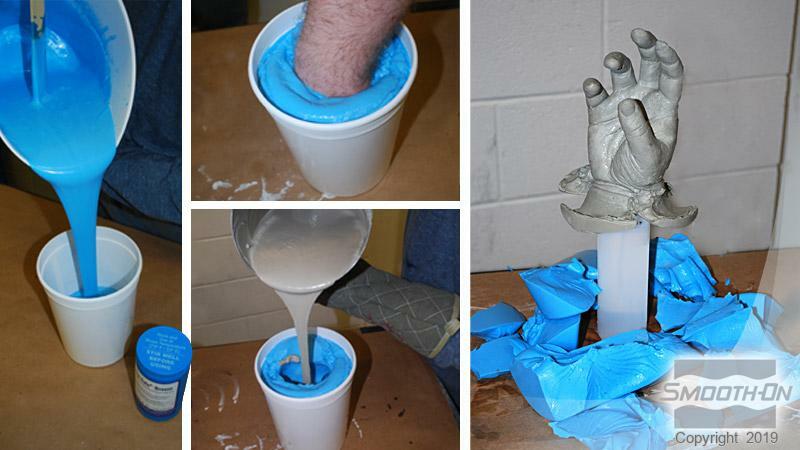 Alja-Safe™ Breeze is perfect for making single-use pourable molds of hands, feet and other body parts. It captures excellent detail, giving you an accurate reproduction of your original. If you want to make a mold of vertical body surfaces, you can use original Alja-Safe™ or Alja-Safe™ Acrobat™. Alja-Safe™ Breeze is easy to use and cures quickly. It reproduces fine detail and makes an excellent temporary mold – good for one or two reproductions of any body part. 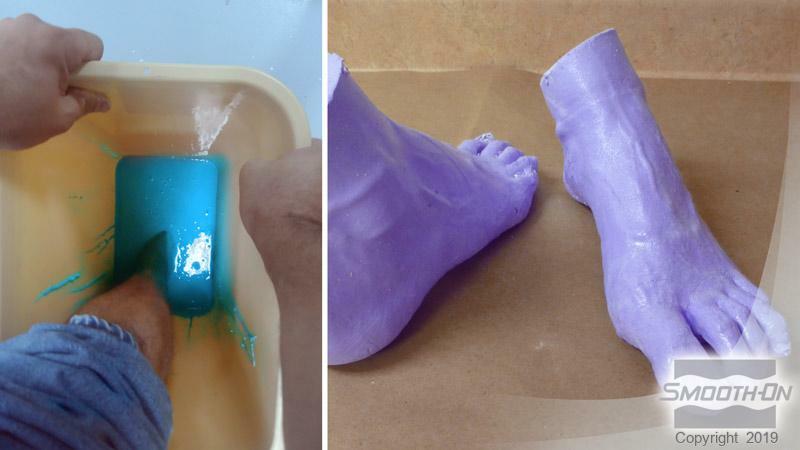 You can then cast plaster, Matrix™ NEO™ (polymer modified gypsum), Smooth-Cast™ 300Q ultra-fast urethane resin or fast setting platinum silicone (such as Dragon Skin™ FX Pro) into the mold to make a reproduction. Preparation - Store and use Alja-Safe™ Breeze at room temperature. Alja-Safe™ Breeze may get warm in storage/shipping during the summer months which will cause the material to set too fast. To remedy, store Alja-Safe™ Breeze in a cool area (60°F - 70°F or 15°C - 21°C) for 24 hours before using. Alja-Safe™ Breeze has a limited shelf life and should be used as soon as possible. Do not allow moisture to come into contact with unused Alja-Safe™ Breeze. 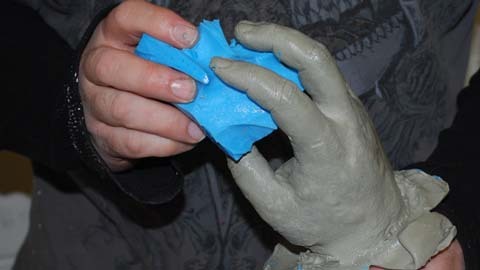 Practice: Make a mold of your thumb – make a mold of something small before going on to larger models. You’ll gain a lot of experience with a small test. Applying A Release Agent – Alja-Safe™ Breeze will not stick to most surfaces. When making a mold of a body part with body hair, a release preparation is recommended to prevent mechanical lock to the hair. CHOLESTEROL Brand Hair Conditioner (available at most pharmacies) can be applied to hair-covered areas prior to applying Alja-Safe™ Breeze. It can be washed out of the hair easily after use. Measuring – Alja-Safe™ Breeze is mixed 5 parts water to 1 part Alja-Safe™ Breeze by volume (5 cups + 1 cup, for example). You can vary the water level somewhat to change consistency of the mixture. Less water will make Alja-Safe™ Breeze slightly thicker. More water will make the mixture thinner. Be careful - too much water may result in the mixture not curing. Water Quality – Water that has a high mineral content (calcium, phosphate, etc.) may cause any alginate to become “lumpy” or not set properly. A small-scale test is recommended prior to mixing large amounts. Temperature Of The Water - At 80° F / 27° C, Alja-Safe™ Breeze will have a working time of 3 minutes and a demold time of 8 minutes. Warmer water will cause the material to cure faster (less working time). Colder water will give a longer working time and slower demold time. For best results, pour Alja-Safe™ Breeze into water and mix as directed. Mixing – Alja-Safe™ Breeze can be hand mixed using a flat, stiff mixing stick with defined edges, but best results will be obtained using a power drill with a mixer attachment. Attach a Jiffy Mixer or Turbine Mixer to a power drill and mix for one minute (depending on volume) to a gel-like consistency. 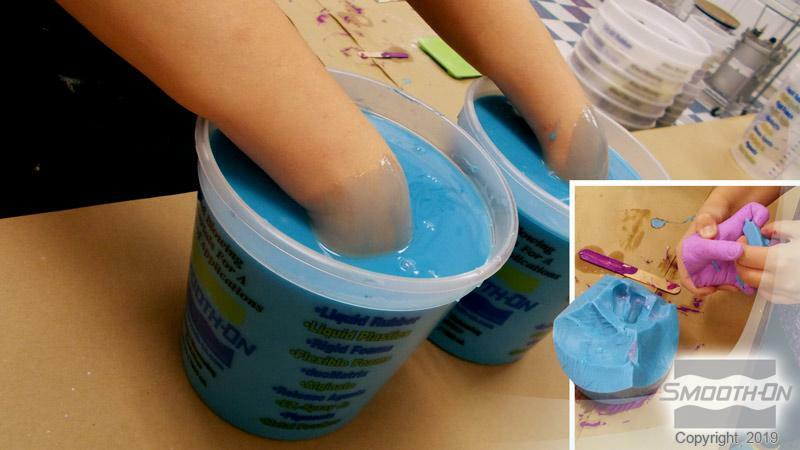 Scrape the sides and bottom of your container using a mixing stick several times. Color Change Indicator - After mixing for the appropriate amount of time, the color turns from dark blue to light blue and the consistency becomes thicker and creamier. This is your indication that the material is well mixed and ready to be used. Alja-Safe™ Breeze is best used when poured around an object. Pouring Around An Object - Once mixed, Alja-Safe™ Breeze can be poured around the hand, foot, fingers or other model in a fixed position inside a container. Suspend the model just above the bottom of the container and have at least ½” (1.27 cm) space between the model and the side walls of the container. For Best Results: Apply a thin coating of mixed Alja-Safe™ Breeze to the surface of the model by smoothing a small amount of material on by hand. Pour Alja-Safe™ Breeze into the container at the lowest point and let the material rise around the model. Make sure your model has a good clearance distance from the bottom and sides of the container. Keep your model still until the Alja-Safe™ Breeze sets up. You will know the Alja-Safe™ Breeze has set when it is firm and no longer gel-like. Casting Into The Mold - All alginate molds will deteriorate quickly. It is recommended that you cast into the mold within 4 hours following demold. Materials commonly cast into alginates include Matrix NEO (polymer modified gypsum, available from Smooth-On), plaster, wax, clay and very fast urethane resins (such as Smooth-Cast 300Q). 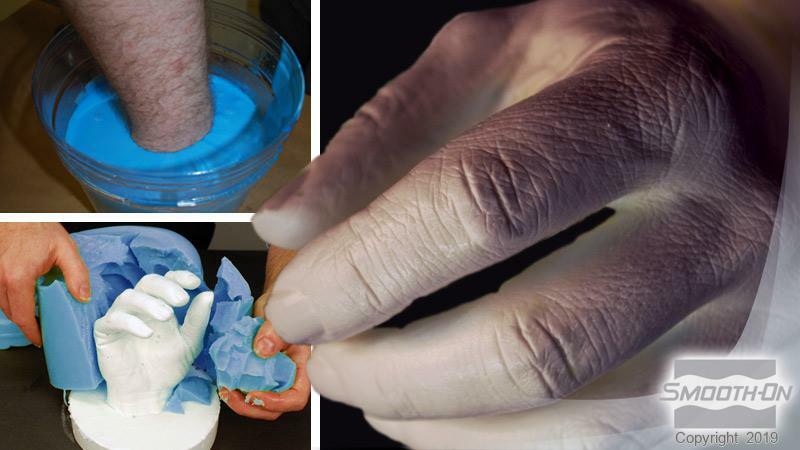 For Soft “Skin-Like” Castings – You can cast Dragon Skin 10 FAST soft silicone rubber into Alja-Safe™ Breeze molds to make realistic hands, limbs, etc. John Fennel used Smooth-On's Alja-Safe Breeze® for creating the initial clay pour for his prop.